On the trail the other day I came upon an elderly Korean couple with full bags of fiddleheads and devil's club buds. They looked a little guilty clutching their haul, probably because the rules about foraging in state parks are ambiguous and rarely posted, and my interest might have struck them as of a vaguely law enforcement nature. Then I emptied my pockets and revealed my own small stash of fiddleheads gleaned along the way. Big smiles now. The Koreans were surprised that someone of my age and ethnicity knew about the hidden delicacies in the woods. It's true that most of the foragers I encounter tend to be older first-generation immigrants. As I say in the book in the squid-jigging chapter, foraging comes natural to such folks. They foraged in their native countries and see no reason not to forage in their new adoptive homes. In many cases they find far less competition, as Americans are too busy porking out at the usual fast food drive-thrus. You can read more about foraging and cooking fiddleheads here. I decided on the Fiddlehead Frittata mainly because I like the alliterative sound of it. 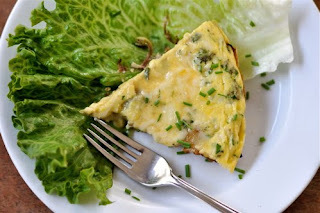 If you had asked me yesterday what I thought about frittatas in general, I would not have put myself in the camp that is absolutely nuts for this Italian staple, though I might have given an appreciative nod to its simplicity as well as the long-standing tradition of saving a few wedges for later. But now, after chowing down on today's Fiddlehead Frittata for lunch, I can safely say it's a thing of awe-inspiring beauty. I also got lucky in the choices I made: the slight bitterness of the fiddleheads was balanced nicely by the sweetness of the caramelized onions and the bright flavors of the herbs, in particular the sage. Like so much of the cooking I do, the frittata is rustic country fare—peasant food, as they say. It fits right in with my love of chowders and stews and casseroles. I'll be making more in the future. 1. Heat oven to 350 degrees. On stove top over medium heat add oil to 10-inch non-stick, oven-proof skillet. Saute onions for a few minutes, then add fiddleheads. Cook for several more minutes, until onions begin to caramelize and fiddleheads are tender. 2. Whisk together eggs, cream, and your favorite herbs. I used thyme, oregano, parsley, and sage. Add grated mozzarella to mixture. 3. Reduce stove to medium. Pour egg mixture into skillet, tilting pan slightly to insure even distribution. Cook until eggs have firmly set on the bottom, 5 or 6 minutes. 4. Sprinkle parmesan on top and finish cooking in the oven, several more minutes. 5. Remove skillet from oven, allow to cool for a minute or two, then slide frittata onto large serving dish (or cover pan with dish and invert if easier, but remember to flip frittata back over or cheese will run off). Cut into wedges and serve. amazing.... I have never cooked with fiddleheads and only eaten them at restaurants, it is only after the fiddlehead season is over that I remember I can forage them myself...and then I feel silly buying them. Hopefully I am not too late this year. I have always understood that fiddleheads from bracken are carcinogenic. Are you refering to some other fiddleheads? Megan - You're not too late. Go get some! Le Loup - These are lady fern fiddleheads; in the eastern U.S. you usually get ostrich ferns. Neither is considered carcinogenic. 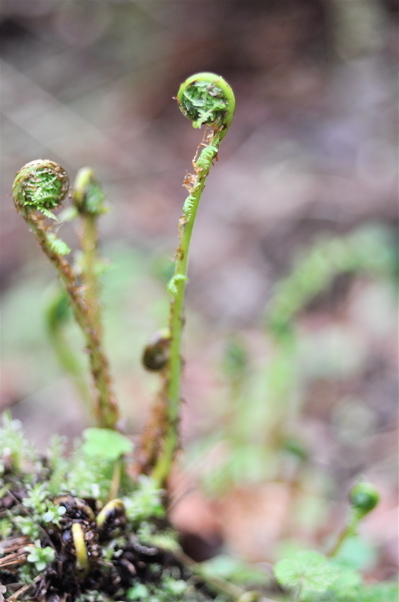 As for bracken fern, while studies have linked their fiddleheads to higher rates of stomach cancer, they're considered a delicacy in Japan and were routinely eaten by Native Americans. Since charcoal grilled burgers are also carcinogenic, I suppose it comes down to one's comfort level. Thanks for the reply LC. Seeing as we don't eat any fast foods, I think I will give the fiddleheads a miss! Your Frittata looks awesome, we'll have to try it. We love fiddleheads, usually just steamed with a little lemon butter, but we're still a few weeks away from their season in the Northeast. Ours are the ostrich ferns. There's a great, big patch of eastern fiddleheads (ostrich fern, as you noted, Lang) along a river near us here in Vermont. They probably won't be up for another week or two. Thanks for the reminder to check soon! 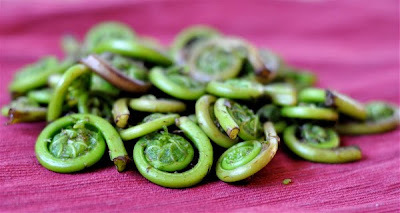 When I lived on my farm in upstate New York (Watertown area), we gathered and cooked fiddlehead ferns (along with LOTS of ramps) every spring. However, my experience with the northwest variety of the fiddle head is that they are rather fibrous and not nearly as tender as the northeast variety. Have you used both varieties so as to compare? Le Loup - As you're in New England, I'd encourage you to give the ostrich fern fiddleheads a try. They're the most choice of all and don't pack the carcinogens found in bracken fern. Sherry - The Frittata was killer. I'm envious of your ostrich fiddleheads--those are the best. Tovar - Have you tried freezing fiddleheads? I pickled a bunch last year but might try freezing this time around. If you have a nice big patch nearby you might consider putting some up. DocChuck - It's true that the lady fern fiddlehead of the West Coast is not the equal of the ostrich, though I wouldn't call it fibrous. Blanched and sauteed it's still fairly tender, though it can be slightly bitter. I've never tried a side-by-side taste test, but that would be a worthy experiment. I had the chance to taste bracken and ostrich fiddleheads side by side last summer--prepared by wild foods author Teresa Marrone at a farmers market cooking demo. The ostrich fiddleheads were good; the bracken ones, absolutely fantastic, really a delicacy. So, while while I wouldn't make a steady diet of them, I would take the risk. We're just a few days away from fiddlehead season here in MN/WI. fantastic looking frittata mate. I really enjoy fiddleheads, they have such a unique taste. Thanks LC, but look closely, that is New England Australia! No, I haven't tried freezing them. Would you blanch them first, do you think? hey there, I'm happy to have found your blog -- I'm your latest follower. I found you via the nettle ravioli with sage butter recipe, which I may just have to try out this weekend. Your recipes look fantastic. I'm always struggling to come up with ideas for fiddleheads, and last night I served them with a Korean-style dressing... I had no idea until reading this post that fiddleheads are also part of the Korean food culture. It makes sense -- the salad was delicious. We blanche (3min) then freeze ...we enjoy fiddleheads all year long! Balsamic vinegar is also yummy on them! I read recently that to avoide the toxicity in the fiddleheads, they should be harvested before they start to uncurl. Any comments? Le Loup - That's true. The unfurled fronds of ferns are toxic. Only eat the newly emerged and tightly curled fiddleheads. And only certain species. In the U.S. it's mainly the ostrich and lady ferns.